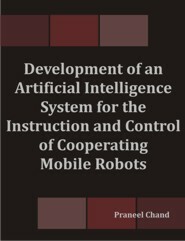 This thesis focuses on the development of an artificial intelligence system for a heterogeneous ensemble of mobile robots. Many robots in the ensemble may have limited processing, communication, sensing, and/or actuation capabilities. This means that each robot may not be able to execute all tasks that are input to the system. A hierarchical system is proposed to permit robots with superior processing and communication abilities to assign tasks and coordinate the less computationally able robots. The limited processing robots may also utilise the resources of superior robots during task execution. Effective task allocation and coordination should result in efficient execution of a global task. Many existing approaches to robot task allocation assume expert knowledge for task specification. This is not ideal if a non-expert human user wants to modify the task requirements. A novel reduced human user input task allocation and feedback coordination technique for limited capability mobile robots is developed and implemented. Unlike existing approaches, the presented method focuses on expressing tasks and robots in terms of processing, communication, sensing, and actuation physical resources. This has the potential to allow non-expert human users to specify tasks to the team of robots. Fuzzy inference systems are utilised to simplify detailed robot information for comparison with simple human user inputs that represent task resource requirements. Like many existing task allocation methods, a greedy algorithm is employed to select robots. This can result in suboptimal task allocation. In addition to this, the non-expert user’s task specifications might be erroneous in some instances. Hence, a feedback coordination component monitors robot performance during task execution. In this thesis, a customised multi-robot mapping and exploration task is utilised as a model task to test the effectiveness of the developed task allocation and feedback coordination strategy. Extensive simulation experiments with various robot team configurations are executed in environments of varying sizes and obstacle densities to assess the performance of the technique. Task allocation is able to identify suitable robots and is robust to selection weight variation. The task allocation process is subjective to fuzzy membership function parameters which may vary for different users. Feedback coordination is robust to variation in weights and thresholds for failure detection. This permits the correction of suboptimal allocations arising from greedy task allocation, incorrect initial task specifications or unexpected failures. By being robust within the tested limits, weights and thresholds can be intuitively selected. However, other parameters such as ideal achievement data can be difficult to accurately characterise in some instances. A hierarchical hybrid deliberative-reactive navigation system for memory constrained heterogeneous robots to navigate obstructed environments is developed. Deliberative control is developed using a modified version of the A* algorithm and a rectangular occupancy grid map. A novel two-tiered path planner executes on limited memory mobile robots utilising the memory of a computationally powerful robot to enable navigation beyond localised regions of a large environment. Reactive control is developed using a modified dynamic window approach and a polar histogram technique to remove the need for periodic path planning. A range of simulation experiments in different sized environments is conducted to assess the performance of the two-tiered path planning strategy. The path planner is able to achieve superior or comparable execution times to non-memory constrained path planning when small sized local maps are employed in large global environments. Performance of hybrid deliberative-reactive navigation is assessed in a range of simulated environments and is also validated on a real robot. The developed reactive control system outperforms the dynamic window method. Dr. Praneel Chand works in the School of Engineering and Physics at the University of the South Pacific (USP), Suva, Fiji. He received his Ph.D. in Electronics and Computer Systems Engineering from Victoria University of Wellington, Wellington, New Zealand. He completed a PGDEngTech and BTech in electrical and electronic engineering at USP. Praneel is a member of the IEEE and its Robotics and Automation Society (RAS). His research interests include cooperative mobile robot systems, mobile robot navigation and autonomous control systems.